by Susan Lynn Peterson, Ph.D. Injuries happen in the martial arts. Most martial artists have a first aid stash: aspirin or something similar, ice packs, bandages, some kind of muscle rub, and perhaps power drinks to boost energy. Western herbs can make a valuable addition to this stash. If you’ve considered adding some herbs to your first aid kit, you need to know a few things first. Most important among these things is this: herbs demand a level of personal responsibility greater than simply handing your body over to a medical doctor for treatment. Just because an herb is “natural” doesn’t mean that you can’t hurt yourself with it if you don’t know what you’re doing. Most herbs don’t come with a warning label, so if you wish to treat yourself, you must learn for yourself what dangers and contraindications each herb possesses. Many herbs are not standardized to specific dosages, so you won’t have a pharmacist telling you to “take two three times a day.” In short, before using any herb, you should research its best uses, the dosage, and any contraindications. Read about the herb in at least three reliable sources. Then the next time your doctor sends you home with the instructions to, “stay off it for a week and see how it feels,” your knowledge of herbs can be a great help. Herbs can help manage pain and swelling, can help speed healing, and can help minimize some of the annoying little symptoms associated with the healing process. Arnica is one of the most common and effective bruise treatments in the Western herbal first aid inventory. Since the Middle Ages, arnica flowers have been made into oils and salves to treat bruises and sprains. Today, even some American plastic surgeons have discovered arnica for postoperative pain and swelling. Arnica contains a mild anesthetic, an antiseptic, and helenalin, an anti-inflammatory agent. The helenalin is perhaps the most intriguing. The mechanism helenalin uses to reduce swelling is well-tested and known to work. It is, however, unlike aspirin, ibuprofen, and all the other NSAIDs used by Western medicine. Researchers aren’t sure how it works, but they know it does, and they know it offers a completely unique alternative to other anti-inflammatories on the market. When choosing an arnica preparation, be careful that you are getting an herbal preparation, not a homeopathic one. The herbal preparation is made from infused arnica oil or arnica tincture. The homeopathic preparation contains very little actual arnica and has been formulated for use following homeopathic principles. You are more likely to find a European arnica cream than a North American one, for example, Weleda Arnica Ointment, is a reputable German brand. Be aware that arnica is for external use only. It is very toxic when taken internally. Arnica is best used to reduce the swelling and pain of bruises. It may help with the black-and-blue color, but that it not its area of expertise. If you also wish to treat the color of the bruise, begin with arnica but don’t stop there. Use arnica until the body has stopped bleeding into the bruise, and the swelling has gone down, typically a day or two after the injury. At that point, brew a fennel decoction using 1-2 teaspoons of the seed in a cup of water. Cool the mixture until it’s still hot, but not so hot that it will damage the area of the bruise. Soak a compress in the decoction and hold it on the bruise for about 20 minutes. As the compress cools, warm it up in the decoction. Apply the compress three times a day until the bruise fades. You can make the fennel decoction in the morning and reheat it later in the day, but make a fresh decoction each day. The heat of the compress helps improve circulation, clearing the collected blood and the waste products of the healing process. The fennel is a mild anti-inflammatory and analgesic. For sprained ankles especially, but also for other sprains, comfrey is the herb you want in your first aid kit. The word “comfrey” means “to grow together.” Comfrey contains allantoin, which stimulates cell proliferation and encourages healing. Studies of patients with sprained ankles show a clear superiority of comfrey over placebo in reducing pain, swelling, and the total time required to heal the injury. Comfrey roots work better than leaves for deep tissue injuries. You can make a decoction of the roots, cool it to room temperature, and soak the affected area. As the sprain heals, you can use the decoction warmer than you would for a fresh injury. Infused comfrey oil also works well on sprains. When the injury is fresh, spread the oil lightly on the surface of the skin. Do not massage a fresh sprain. 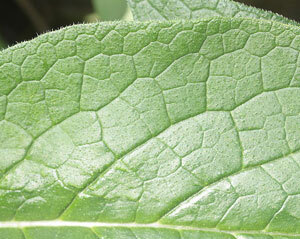 When the damage has healed and all that remains is the stiffness, you can use the comfrey oil as massage oil. Commercial preparations are available. Mountain Rose Herbs carries organic comfrey oil that will save you the trouble of infusing your own. Merck Kytta Salbe (German for “Comfrey Salve”) is a reputable brand of comfrey ointment. Sometimes wounds do not heal as they should. If a wound heals with a patch of skin around it that feels “dead,” the wound probably caused some nerve damage. The best herb in your herbal first aid kit for nerve damage is St. John’s Wort. St. John’s Wort has a reputation for being an internal herb for depression and anxiety. Though it has a good track record when used internally, St. John’s Wort makes a good infused oil as well. The oil, made from the flowers of the yellow St. John’s Wort plant, turns a beautiful red the longer it infuses. The red pigment comes from the little black dots on the margins of the petals. These dots contain hypericin, one of the active ingredients in the herb. You can make your own infused oil using either fresh or dried flowers; however, homemade oil does have a tendency to mold while it’s macerating. Commercial products are also available. St. Johns’ Wort has been used for injuries with nerve involvement since ancient Greek times. Commission E also recommends it for contusions with nerve involvement. To help promote healthy nerve regrowth, wait until the wound has closed and the scab is gone. Then thoroughly massage St. John’s Wort oil into the area. Massage helps the oil penetrate the skin and also helps break up scar tissue. The oil can also be used on jammed fingers and toes to help with pain and encourage healing of the soft tissues, especially the nerves. If the injury is fresh and still swollen, apply the oil to the surface of the skin and don’t massage it in. Massage can further injure the joint. 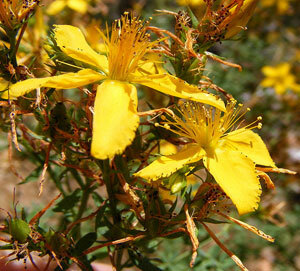 Note that St. John’s Wort causes photosensitivity in some people. Be careful using it if you are going to be out in the sun. Rose hip seed oil is your best ally if you wish to prevent long-term scarring due to a cut or scrape. Rose hip seed oil is made from the genus Rosa affinis rubiginosa. This South American plant is known as rosa mosqueta in Spanish. However, several other species of unknown medicinal value are also called rosa mosqueta, so try to find an oil labeled with the scientific name. Rose hip seed oil comes in tiny bottles for which vitamin stores tend to charge high prices. The oil is cold-pressed from the tiny seeds of the rose hip. Heat damages the oil, so the relatively inefficient cold-press method must be used to extract the oil. Consequently, rose hip seed oil, if it’s the real thing, is not cheap. Once you get it, make sure to keep it in the refrigerator. It goes rancid quickly. Wait until the wound has closed and the scar is completely gone. If you use rose hip seed oil too soon, it may interfere with healing, creating a larger scar rather than preventing one. Put a few drops of rose hip seed oil on your fingertip and massage it well into the scar. The massage helps the oil penetrate the skin while also breaking up scar tissue beneath the surface. For body aches, you want a counterirritant. A counterirritant is an irritant used to treat an irritant. For example, if you’ve ever had a mosquito bite your first impulse is to scratch it. The bite is an irritant, and you address the irritation by further irritating the skin with your fingernails. Why? Part of counterirritation is simply a distraction. Your mind goes to the sensation of scratching instead of the original itch. Counterirritation goes beyond distraction, however. When a counterirritant herb is applied to the skin, it sinks in and produces a sensation of heat (like cayenne) or coolness (like mint). The nerve ending gets busy transmitting information about these sensations to the brain. Eventually, as they continue to work, the nerves are depleted of neurotransmitters, and the sensation from the counterirritant as well as the original pain or itch is reduced. In short, counterirritants used on pain, tend to moderate that pain. Tiger Balm, BenGay, capsaicin cream, and many other over-the-counter liniments work on the principle of counterirritation. You can make your own liniment or balm by using various oils. Use the herbs straight for a liniment. Add some aloe vera gel or petroleum jelly to help it stay where you put it. Or heat the oils and add roughly a half an ounce of beeswax to make a salve. As is, this is a pretty potent balm. If you want to decrease the potential for skin irritation, cut back on the camphor and eucalyptus, and/or increase the amount of almond oil. Either way, you do not want this balm anywhere near your eyes or nose. Patch test it before using it on a more extensive area. After a hard regimen of training, it’s sometime hard to get to sleep because of the delayed onset muscle soreness. A good massage oil can help. Mix a couple of drops (no more) of the essential oils of ginger and lavender into roughly 5 teaspoons of a carrier oil such as almond oil. Mix the oils thoroughly. Massage the oil into painful areas before bed. Be very careful with the ginger essential oil. It is strong and shouldn’t come in contact with skin in its undiluted form. It’s also dangerous when taken internally. Be cautious not to use this massage oil near the eyes. Also avoid massaging bruised or swollen areas, areas where capillaries are damaged. In bruised areas, spread the oil gently over the skin but avoid any deep massage that can further damage the area. If you have sensitive skin, watch your skin for signs of irritation before falling asleep. When used properly, however, the ginger in this oil warms the skin and muscles and acts as a counterirritant. The lavender has local anesthetic properties and helps reduce inflammation. The smell of the lavender will also help you sleep. Learning to use herbs well, like any other worthwhile skill, takes some time and effort. Herbs that are strong enough to work are also strong enough to do some damage if misused. For instructions on making decoctions, infusions, and infused oils, consult Western Herbs for Martial Arts and Contact Athletes or visit to my website. Some simple knowledge and a few skills can help you make some valuable additions to your basic first aid kit.